I was born in Warsaw on November 20th 1924. Before I tell you about my life I would like to tell you a little bit about my family. My mother was born in Lithuania and my father in Warsaw, but from a family that viewed itself as being from Vilnius, Lithuania, as well. In my mother's family a very strong figure was her grandfather who must have been born around 1820. As a young man he walked to Petersburg, and became in due time the manager of the properties of a major Russian nobleman. When he was a very old man, and my mother was a young girl, she was very pleased and surprised to have her grandfather received like the Prime Minister of the Emperor, which this man became. He came back home and established a family. One of the most striking features about him was that he decided early on that all his granddaughters were to become doctors. For this reason my mother became a doctor, and later became a dentist. Her sister was a doctor; in fact, almost everyone in the family, all the women in her family were doctors as well. On my father's side most of the men were scholars, they had, some had in fact no clear occupation, They were wise men who were supported by a group of faithful who worked for advice, leadership etc. My father however was from a different generation and became a businessman. My mother went to medical school before World War I. They had married shortly before, then they had a child, and during World War I had a very adventurous life because of all the different terrible things happening in Eastern Europe. At one time, they were in Krakówow during the Russian civil war with my uncle - my father's younger brother- who was to become a very important person in my life, was there as well as a student of mathematics. It sounds strange, but it was so; the civil war was raging but the mathematics department of the university was going on as if nothing were wrong. Shortly after World War I my parents lost their child in an epidemic, and then had two more sons: myself and a younger brother. This fact is important because my mother, as a doctor and a bereaved mother, had a great fear of epidemics. After a few years of very normal, very happy, problem-free childhood, the question arose: would she let me go to school? She was so afraid of epidemics that she didn't let me go to school. However, there was an uncle who was a very cultured man, but almost permanently unemployed, - life was very, very rough in Poland, who was hired to be my tutor. So for two years of learning reading and writing, counting and the alphabet, I was tutored by this man who was quite unskilled in the art of being a tutor or a teacher. He didn't think it was fun to teach me the alphabet, so I didn't learn it. At least I learnt the beginning and the end, but not the middle. He didn't think it was fun to teach me table multiplication, so I never learned - well, I know most of it but with glaring gaps. He taught me how to read maps, how to play chess, how to argue, how to hold opinions on various subjects which he felt strongly about and, all in all, it was quite a strange, strange, strange beginning to my education. 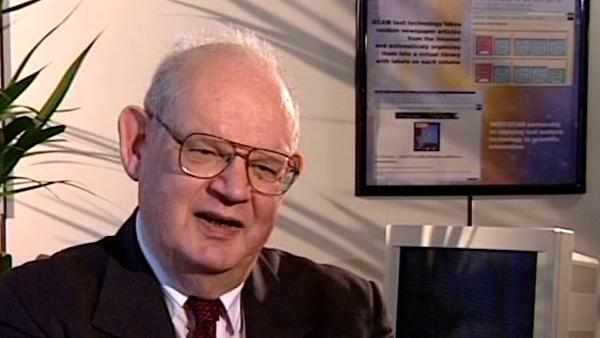 Benoît Mandelbrot (1924-2010) discovered his ability to think about mathematics in images while working with the French Resistance during the Second World War, and is famous for his work on fractal geometry - the maths of the shapes found in nature. Daniel Zajdenweber is a Professor at the College of Economics, University of Paris. Bernard Sapoval is Research Director at C.N.R.S. Since 1983 his work has focused on the physics of fractals and irregular systems and structures and properties in general. The main themes are the fractal structure of diffusion fronts, the concept of percolation in a gradient, random walks in a probability gradient as a method to calculate the threshold of percolation in two dimensions, the concept of intercalation and invasion noise, observed, for example, in the absorbance of a liquid in a porous substance, prediction of the fractal dimension of certain corrosion figures, the possibility of increasing sharpness in fuzzy images by a numerical analysis using the concept of percolation in a gradient, calculation of the way a fractal model will respond to external stimulus and the correspondence between the electrochemical response of an irregular electrode and the absorbance of a membrane of the same geometry.